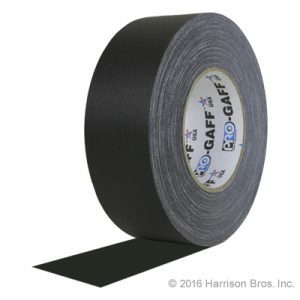 Gaffers tape is woven cloth tape, made from cotton thread, it is not shiny like duct tape (reinforced vinyl), and thus does not reflect light. Set designers and stagehands rely on this finish because it means that they can make repairs, secure cables, and hide things the audience shouldn’t see, simply by applying a strip of tape. It is almost invisible in most performance environments. A tape that does not draw attention to itself and doesn’t reflect bright lighting has countless uses. I spend a lot of my time on the phone with new customers. Having a great crew to take care of shipping orders, purchasing from vendors, managing web sites and taking care of administrative duties means that I get to talk with people who use our products. Above all, it is the best part of my job. Today we have posted a number of spec sheets about gaffers tape. Prospective customers want to know about the differences in the gaffers tapes we sell. These spec sheets hopefully will provide some of the information they are seeking. Until you have used a number of different products, it is hard to understand how something as seemingly insignificant as one mil (1/1000 of an inch) in tape thickness can make a difference. You’d be amazed at how much easier it is to handle a 12 mil tape than a 10 mil tape. Often prospective customers want to know why the gaffers tape we sell is more expensive than some others that they have heard of. The specs tell the tale. Thickness-Gaffers tape is offered in thickness as thin as 10 mils. Choose a tape of at least 11.5 mils (12 mils is better). It won’t c-u-r-l back and stick to itself, and, above all, it is stronger and tears more cleanly. Adhesion-“Adhesion to steel” is the quantifiable spec for determining how sticky a tape is. For instance, look for an adhesion number of at least 60 oz. per inch to insure that the tape will hold properly. Adhesive composition-The best gaffers tape uses a synthetic rubber adhesive. Less expensive products use an acrylic adhesive which is not as strong and which will not stand up to tough environments. Our comparison page includes both products we sell and others that are offered by our competitors. In conclusion, we hope you find it useful.